JNN 21 June 2014 Washington – Americans’ confidence in the news media has tumbled to fresh lows — and it doesn’t much matter whether the source is newspapers, television or the Internet. Confidence in US newspapers was marginally better than rival media, but dropped to 22 percent in the June 5-8 survey — declining more than half from a 1979 peak of 51 percent. 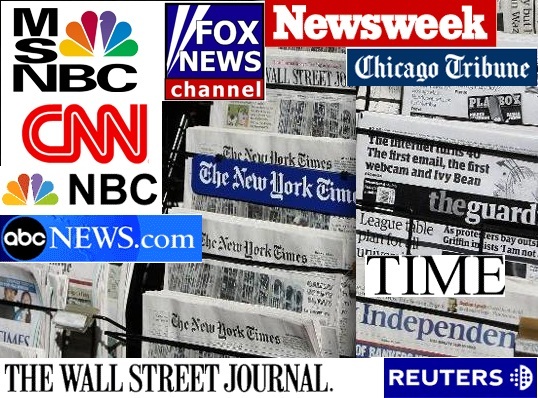 As the Analyst term the Low level of Confidence shown by the General American Public in the Local Media is due to the Biased attitude and Secondly due to the Big Conspiracies which are being conducted through the Media Moguls , As it may be the Incident of 9/11 , or even the Much fabricated issue of the Holocaust , where the Heroes are Painted by the Media as traitor and Dictators , and at the same time , the Much Decorated Heroes of the Media , where actually the Traitors and the Killers of the Masses , as over the Period time , and due to the Rapid Growth in the Globalization of the Internet , and other forms of Communication , where the General Public has come to the conclusion , that the facts are being distorted by the Main Stream US Media , and its Biased Attitude controlled by the Zionist Lobby and Secondly by the Pentagon and others , has lost its credibility , and now the General Population is least Bothered about the stories being fabricated by the US Media . While the People who are really interested in getting the Real Picture of the Current Affairs , log on to other smaller but more credible News sources , as they have gained More confidence of the Public , due to their Factual coverage of the events . And Un Biased Coverage of the Events and excess is also available, Due to their Online Status. This entry was posted in Jafria, United States and tagged American public, Biased, Gallup poll, Gallup survey, media platforms, television news, US Media. Bookmark the permalink.